I have written before that for me, paganism is a way of living rather than a theology or a specific belief system. At the core of my practice is an awareness of being in relationship with Nature. Despite the many infrastructures of 21st century civilization that we live in, we are fundamentally organisms existing on a particular planet, in a particular ecosystem. We are beings being, in Nature. One way I like to think about being in Nature is to be ready to work with all the elements no matter where we may find ourselves. Ironically, I have found that I have a lot to learn about being outdoors in Nature, from people who usually do not identify as pagans, but who live in ways that seem much more pagan to me. For the past few years I have tried to learn how to be outside more easily, without feeling like an interloper when I am in Nature. In return, I have tried to bring my spiritual awareness to my time in Nature. One example of this is in my EDC strategy. EDC, or Every-Day Carry, is simply a specific strategy one uses to have a particular set of tools or supplies always ready-to-hand, usually carried in a bag or a pouch of some sort. Whether one thinks in terms of a strategy like this or not, most of us employ it. How many of us leave the house without our keys, our cellphone, and our wallet? These simple items are part of our every-day carry. 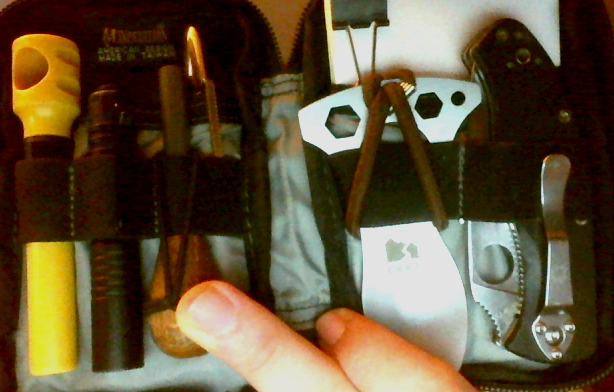 My EDC (everyday carry) pouch, containing useful tools representing all the elements. From right to left I have a knife (Air), an eating tool (Earth), a stack of 3×5 index cards and a small pen for recording my thoughts (Ether), a ferro rod for firestarting and a small flashlight (Fire), and finally a corkscrew (Water) — I go to a lot of gatherings with mead and need a convenient way to open the bottles! When I leave the house I nearly always carry a glass water bottle filled with spring water to complete my EDC for Water. The remainder of this article will take a closer look at these items and the elements they represent. “isn’t used for cutting purposes in Wicca, but to direct the energy raised during rites and spells…. The knife is often dull, usually double-edged with a black or dark handle. Black absorbs power. When the knife is used in ritual to direct energy, some of this power is absorbed into the handle — only a tiny amount — which can be called upon later.” (Cunningham, Wicca: A Guide For The Solitary Practitioner, p. 30). These days, Cunningham’s approach seems a bit abstract to me. Though I have great respect for Cunningham’s legacy in the pagan community, thinking of a knife in this way, with the dulled edge, used only as a sort of “energy” conduit misses the point for a regular practice of a person being in Nature. Our hunter-gatherer ancestors certainly carried the best edges they could — whether forged metal or flintknapped stone — but the edges carried by our ancestors were meant to be used, very practically, with an immediacy far beyond the abstraction of an energy conduit. For our ancestors, their knives were tools that allowed them to survive, to exist in a deeper, more effective relationship with their ecosystems. In my view, the defining characteristic of a knife is the intelligence and knowledge required to create, use, and maintain it. A knife — at least not a modern metal knife — does not spontaneously appear. It requires wit and insight, specific construction techniques that were discovered over eons of time. Furthermore, a knife is the fundamental tool of bushcrafters: it is the tool that allows one to create other tools. In this sense, I think of a knife as a meta-tool. In this way it represents the “airiness” of intellect, of imagination, and the skill that accompanies both of those. We can imagine a tool that we need, and with the technique we know with a good blade at our service, it allows us to create these tools. Tools made with knives can be anything from a bow-drill set to start a fire, to a spoon to eat with, to lashed-together saplings for a shelter, to batoning through wood to make it more suitable for burning, to a weapon, snare, or trap for hunting. This tool is in service to our imagination, to our intellect, and to our skill. My EDC blade is a folding knife that is big enough to fit in my hand, yet small enough to fit into my EDC pouch that I use. This goes with me everywhere. In my bag I keep any one of several larger knives that I think will best serve me in the circumstances I expect to encounter. To me, humanity’s relationship with Fire in the 21st century may be the most out-of-balance of all the elements. Very few of us can start a fire without the aid of convenient fossil fuels, yet nearly all of us stare into glowing screens for a good chunk of each day. Apart from this, fossil fuels burn in nearly every home and vehicle. Learning to start a fire without fossil fuels has been a very rewarding exercise for me. I can sometimes succeed with primitive technologies such as a bow drill or a hand drill (which I can make in the woods with my knife and access to the proper materials and conditions), but to save time I carry the ferro rod with me. This ferrocerium rod, when scraped against steel, produces small sparks that are thousands of degrees Fahrenheit, and can easily start a fire when one has an adequate tinder bundle (ie, a small grouping of dry, flammable materials, such as birch bark, small wood shavings, fatwood, etc). In my bag (which often comes with me when I leave the house), I also carry a very small portable stove and tinder that will allow me to create a small fire for any reason, including warmth and cooking. In addition to the ferro rod, I carry a small flashlight that is an astonishing piece of technology. It is a small LED flashlight, powered by a single AAA battery, that produces enough light to illuminate an entire yard. If I need photons, I can easily generate plenty of them using this tool. When I use it with a rechargeable AAA battery, it is also an extremely efficient use of electricity. I’m a bit of a fanatic about water. Most of the water I drink is water I have gathered myself from a spring a short drive from my house. Going to the spring is like going to church for me, and keeps me in tune with this most important element. It is a peaceful place in the western mountains of Maine, where the best water I’ve ever tasted comes naturally up from the aquifer deep inside the Earth to the top of the mountain, where I collect it 20 gallons at a time in glass containers. When I leave the house, I always have a water bottle with me. Usually it is a recycled, 1.5 liter glass wine jug, but sometimes it is a smaller 24oz bottle. The corkscrew in my EDC pouch is a tongue-in-cheek nod to the fact that I often bring my homebrewed mead to various gatherings I attend, and a way to open the corked bottles is quite useful. Between these two, the element of Water is quite well represented. Apart from having a way to boil (ie, purify) wild water, I am considering getting a water filter, something like the Lifestraw personal water filter, to keep in my larger bag. But because water is is so essential to our survival — it is said we can survive for 3 minutes without Air, 3 hours without shelter (ie, Earth, at least in adverse conditions), 3 days without Water, and 3 weeks without food — I usually carry my own water with me everywhere I go. Staying hydrated is very important to me; I typically drink about a gallon and a half of water per day. Earth symbols are perhaps the least abstract of all the elements. Shelter. Food. Shoes. Eating utensils. We are, after all, earthly creatures, existing on this specific planet, and we are inseparable from it. In some ways it is difficult to think about the element of Earth in terms of surviving in Nature, because these are the most common concepts in survivalism. Everything we put into our body is of the Earth. For my pocket EDC kit, the Earth tool is a small eating tool/spork that sometimes comes in handy. In my bag I also carry a small pot that I can use to cook in, quite compatible with my portable stove. Other symbols that go in my larger bag are two stones: first is a small sharpening stone to maintain an edge on my knives in the field. Second is a stone that I use as a bearing block when attempting primitive fire with a bow drill. Lastly, there is cordage to consider. I keep cordage in my larger back, a small roll of jute twine which I use whenever I can because it is a natural material. Additionally, I also keep a few hundred feet of “paracord,” also called 550 cord. This artificial material is small, light, and thin, and is rated to support weights of up to 550 pounds. Very useful stuff for many tasks, including shelter building (ie, lashing two supports together to build a primitive shelter). In some ways, Ether is the most difficult to implement because it doesn’t really have a common, traditional tool. By definition, it is somewhat vaporous and abstract, and it both underlies and flows through the other four elements. One of the strategies I employ as a guideline is to maximize the flow of quintessence, as it manifests in the other elements. For instance, in Earth I will try to eat the best quality, most vibrant, locally grown or harvested food. For Water I try to drink the cleanest, most vibrant water I can. I feel that Fire started with primitive tools have more quintessence — a different vibe — than fires started with fossil fuel or electricity. And air that I breathe in outside — preferably on a beach, on a mountaintop, or in the woods — has a higher vibe (and at least 90% less pollution) than indoor air. So my tool for Ether might be the most abstract, and kind of a “reach” in a sense, which in a way is fitting for this element. It is simply a pen and something to write on. For my EDC kit, I use a Fisher Space Pen which is very durable and can write even in adverse conditions. My “paper” is a stack of 3×5 index cards held together with a small binder clip, which is also more durable than regular paper. With these simple tools, if I manage to pull a thought from the ether, I can at least record it while out and about. James Lindenschmidt has been a pagan for more than 2 decades, having explored many neopagan traditions including Wicca, Grail Spirituality, and more recently, Druidry and Heathenry. These days he identifies more with paganism as an ethos rather than a theology. A large part of his spiritual practice is spending as much time in Nature as possible. He enjoys exploring the intersection between fermentation and herbalism at BardicBrews.net. His degree is in philosophy. Brilliant post James! This is very useful information and I really love how there is a concept of the elements present in something that should seem mundane yet is anything but. Thank you for this post! I shall begin work on mine right away! Excellent article. For me our spiritual practices must be grounded in the environment and our relationship to Nature. Paganism arises out of that relationship. It is the severing of this relationship that has led us to the massive environment devastation we are all facing around the globe. We as pagan people need to lead the way back into good relationship with the Earth. If our spiritual practices don’t support that, then they are of little to no value and are (in my opinion) antithetical to the fundamentals of pagan living. I have always thought abstraction of the elements didn’t serve us well. We naturally relate to the reality of our drinking water, cooking fire, food, and the air we breathe. Our recognition of the sanctity of these elements is at the very core of Nature-based spiritual practices. If we stray too far from direct relationship and experience of Nature, I think we need to reassess and get back outside and away from the hermetically sealed ritual spaces many pagans have inside. Time for us “earth-based” pagans to get our hands and feet in the mud again. It is time we all get back into Nature and learn to craft sustainable honorable relationship, relationship so deep it hums with the sacred. Remember, Deity is in Nature, and therefore exists within our relationship to it.